Carry your laptop conveniently and with style. 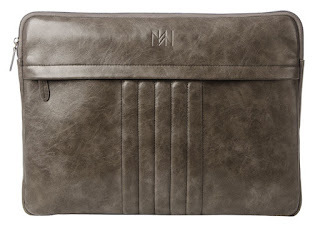 Marbled graphite faux leather sleeve accommodates laptops up to 13” and features a full-length exterior zippered pocket for cables and cords. Open interior is lined with black and grey checkered fabric. Non-interchangeable. Debossed monogram logo; silver hardware. Dimensions: 14 ¾” long x 10 ¾” tall, with a 1” gusset.